When the Apple iPad was introduced, it created an immediate worldwide shortage of folio-style covers. While slipcases and silicon cases were readily available, the slipcases were only useful when you were transporting the iPad. When you want to use the iPad, a slipcase becomes something else to carry. 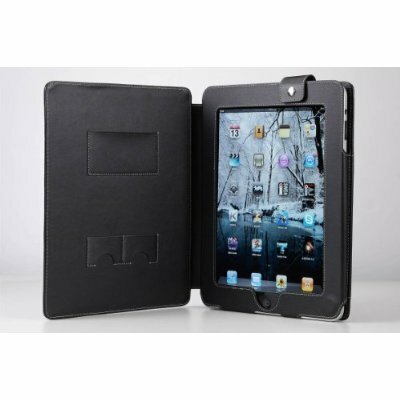 Silicon rubber cases, while making the iPad easier to hold, left the screen unprotected. Folio-style covers were clearly needed -- and the available supply was bought up immediately. MiniSuit’s case (which is not leather) was far cheaper than the few folio covers sold in Apple stores, but that wasn’t really a critical factor. The key factor: it was available via Amazon, which was a minor miracle. Purchased sight-unseen and hoping for the best, all we expected was a folio case that would protect the iPad’s screen and allow you to use the iPad without removing the cover. MiniSuit’s folio cover fit our needs perfectly. MiniSuit’s iPad folio case is quite nice, but not, alas, leather. The leather-like plastic doesn’t have quite the feel of real leather, but it doesn’t look or feels like plastic, either, and presents a professional appearance. The iPad fits into a pocket on the back cover, the front cover protects the iPad screen, and a snap flap secures everything for transport. Because the case is a folio style, you can use the iPad any time, all the time without ever removing it from the cover; you’d never believe how many slipcases are left in restaurants and airports simply because they must be completely removed to use whatever it is they were purchased to protect. There are some small pockets inside the front cover for business cards, which is a nice, unexpected touch. The cover can be propped open to act as an easel, which is great on long flights, or when you simply get tired of holding it. A couple of magnets keep the cover and the "kickstand" for the easel folded flat without any effort on your part, and without any harm to the iPad. It would have been nice to have real leather, but for the price, it can't be beat.